Research by PsychTests.com uncovers the personality traits that can make people more confrontational and argumentative. 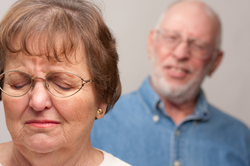 Dealing with confrontational people can be tedious and emotionally draining. Their reaction seems out of the blue or petty to others, but in reality, they are reacting to something very real that is bothering them; they just don’t realize what that really is. Why are some people so easily ticked off? It’s almost like they have an amazing superpower that allows them to see insults where there aren’t any, or uncover villains who seem determined to ruin their day. Can the tendency to pick petty fights be summed up as easily as having a short temper? Not according to researchers at PsychTests.com. The ease at which some people pick fights depends on a complex combination of traits. Using data collected through their Emotional Intelligence Test, researchers at PsychTests compared people based on the frequency at which they find themselves in conflict situations. Argumentative people have less impulse control (score of 51 vs. 67 on a scale from 0 to 100). They tend to do or say things without contemplating the potential consequences. Essentially, they think in the moment rather than thinking ahead. 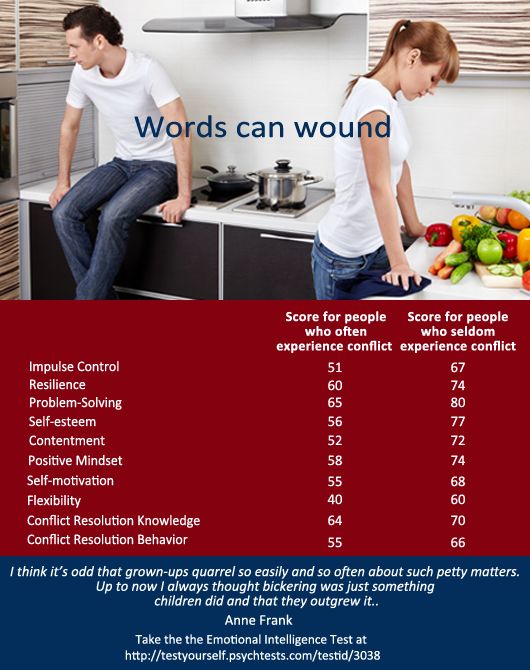 Argumentative people are less resilient (score of 60 vs. 74). They don’t deal with stress or hardship very well and as a result, take their frustration out on others. Argumentative people have more difficulty solving problems (score of 65 vs. 80): The inability to effectively solve life’s problems can lead to stress and, as indicated above, a greater likelihood that others will take the brunt of these frustrations. It goes without saying that yelling until one gets their way would not be considered one of the steps in the problem-solving process. Argumentative people have low self-esteem (score of 56 vs. 77): In order to feel better about themselves, some people zero in on the shortcomings of others, ruthlessly pointing them out and picking on them. Behind many arrogant and antagonistic facades is a fragile self-esteem. Argumentative people are less content with their life (score of 52 vs.72): This may not come as much of a surprise. People who are angry most of the time and complain about their life (and everyone in it) are less likely to be happy. Argumentative people have a more negative mindset (score of 58 vs. 74): It would not be fair to say that every pessimist is petty and argumentative, but when a person has a habit of seeing only the worst in others, they are more likely to start or get involved in arguments. Argumentative people are less capable of motivating themselves (score of 55 vs. 68). This result initially stumped PsychTests researchers until they took a closer look at how confrontational people deal with situations that require a great deal of drive and inner strength. They discovered that the more argumentative people are, the more easily they become frustrated when faced with obstacles; they struggle to dig deep to find the motivation to push forward. Many people are likely to feel a great deal of guilt and shame when they give up too easily – and sometimes, they turn those feelings outward (in the form of anger) rather than face them. Argumentative people are less flexible (score of 40 vs. 60). A 2-year-old having a temper tantrum is pretty common and generally accepted – or at most, frowned upon. An adult having an “adult” version of a temper tantrum (i.e. “We’re doing it my way or else!”) is just as common and generally happens for the same reason: They want something they can’t have, and refuse to accept that they can’t have it. Unlike the 2-year-old however, adults understand the importance of flexibility. Someone who can’t adjust, adapt, and compromise when life doesn’t give them what they want is in for a long, disappointing life, filled with conflict. Argumentative people are less skilled at resolving conflict (score of 55 vs. 66). While this probably doesn’t come as a surprise, PsychTests researchers discovered an interesting twist: They assessed two aspects of conflict resolution: Knowledge (knowing what to do/say to resolve an argument) and Behavior (putting the knowledge into action). There was a gap of 11 points (and only 4 for those who are less confrontational) between Knowledge and Behavior for argumentative people, with Knowledge being systematically higher than Behavior. This means that even when argumentative people know how to resolve conflict effectively and maturely, they don’t always do so. Researchers at PsychTests suggest that if you find yourself dealing with someone who tends to pick fights, don’t allow yourself to get swept up in their tidal wave of emotions. Keep things in perspective in order to maintain control over your own feelings, recognize that you have the choice to not get engaged in the argument, and most importantly, use your empathy and social insight. Perhaps you can help them identify the real issue behind their accumulated frustration, so that they can deal with it directly - and perhaps “lighten up” a little. Want to assess your emotional intelligence? Go to http://testyourself.psychtests.com/testid/3038. To learn more about psychological testing, download this free eBook: http://hrtests.archprofile.com/personality-tests-in-hr. Argumentativeness results from a complex combination of traits that is not limited to lack of emotional control.Confrontational people are more than just short-tempered; they have difficulty with stress, problem-solving, and self-esteem.